BBC NEWS | Have Your Say | Should eBay ban Live 8 ticket sales? Should eBay ban Live 8 ticket sales? Online auction site eBay has banned the sale of Live 8 tickets from its pages. The company initially said it was not illegal to resell charity concert tickets but changed its stance after listening to customers' concerns. The tickets, some on sale for £1,000 a pair, prompted hoax bids from angry users hoping to disrupt sales. These bidders have since had their accounts suspended. Were eBay right to remove listings for Live 8 tickets? Why are eBay allowing the sale of Live 8 tickets to go ahead? What's the problem? These people won their tickets fair and square, and in that regard, it is no different from the proceeds of any other competition. The tickets are theirs to do with as they will. Jealousy is such an unappealing character trait. It all boils down to social conscience doesn't it? At the end of the day if you can justify your actions then you'll do it. I personally wouldn't see a problem with selling the tickets on eBay if the money went directly back to Live 8, but selling tickets for an event raising awareness of the social inequalities and injustice in parts of this world for personal gain just seems downright immoral. Although I think it was ethically wrong to sell the tickets there was no illegal act being done, unlike missing a day off school like Bob Geldof has encouraged children to do. How irresponsible. Are all the artists who play this gig going to give away all their record sales they make from playing in front of a world wide audience in the weeks and months after the show. I think not. If they can make money from this why can't people with tickets. Ebay have done the right thing. I fear that Thatcher's children are truly coming home to roost. The greed of people trying to make a quick quid in today's society astounds me. Donate the money back to charity or use it to buy yourselves a social conscience. How is it any different from selling a prize you win in any other raffle but no longer want? I don't see the problem myself. How is it any different from selling a prize you win in any other raffle but no longer want? Ebay offered to give (at least) their profits to Live 8 so they weren't benefiting from the sales themselves. It should then be up to the individual as to whether they want to sell/buy these tickets, if you object, then don't bid. I got the confirmation through on Monday! I could hardly believe it because I've never won anything in my life (save the bottle tombola). I can't wait to see Pink Floyd! I'm afraid that I have absolutely no respect for those who are selling tickets on eBay, especially when they haven't possibly even received them yet! It is just synonymous with the culture of greed in which we live. If I was fortunate enough to win a couple of tickets I would obviously be thrilled to bits to be able to go. If I couldn't go I would be just as delighted to be able to give them to someone who could. For goodness sake, when is everyone going to wake up to the need for mankind to be less grasping and greedy and learn to give a little rather than take all the time. People who entered with the sole intention of selling tickets on for personal profit are lacking charitable spirit but Live 8 has made their £3m+ from the text entries. What happens to the tickets after that does not lose them money. Some sellers were going to donate to charity which is money the charities would otherwise not have received, as well as eBay's donation. It may not be illegal to sell these tickets, but it is immoral. Unfortunately, profiteering like this is always going to happen as some people give way to their most base instincts. Freedom has it's down sides, people who, say, really like Pink Floyd, will be prepared to pay top whack to see them at Live 8. Sad that there are people who texted in just so they could sell their tickets if successfully picked. It's all well and good Bob Geldof getting on his high horse but I fail to see how selling tickets on eBay is any less morally defensible than rock bands using Live8 for publicity purposes. I think the scariest element of this is that a celebrity is allowed to dictate the moral ethics of a free market economy. The moral choice of whether to sell or buy these tickets is not up to eBay or Bob Geldof to decide - we are supposed to live in a free country. Charity begins at home! If I'd won tickets they'd be straight on eBay...I've got loans and credit cards to pay off. The Live8 tickets could be put to good use twice, once to fend off third world debt and second, a little bit of my first world debt. Multi-millionaire pop stars can harp on all they like, a week's interest on just one of their bank accounts would eradicate all my money worries. I think that by raising this issue, Bob Geldof is simply making a point about a lack of morality in our culture which we accept as the norm. It takes someone to say "This is wrong." Well done Bob. Instead of people selling tickets online with Ebay donating all profit made, they will now sell them to ticket touts who will offload them in the traditional ways. Stopping one selling method has done nothing but mean Ebay now don't have anything to donate. Thanks again, Bob. Why is eBay getting stick for this? eBay offers a service, a very good service, and obviously has a responsibility to block sales that would be illegal but selling tickets is not illegal. It's time Geldof kept quiet - he's becoming tiresome. There have been similar problems regarding Glastonbury tickets and eBay in recent years. Bob Geldof is right to be angry but Live8 organisers should have seen this coming. Whilst it is not in the spirit of Live 8 people should be free to be able to sell the tickets they "won" if they so wish. If Live 8 had thought this through they could have made sure that the tickets were not transferable but this would have added an admin cost for them. I wish that all the artists appearing are as altruistic as the ticket holders are expected to be and give any revenue from increased sales of their music following the concert to the cause. It's hard to believe that this was not considered by the organisers before the competition took place. I entered by text and was not lucky enough to win, but if I had, I would've sold them on eBay and given half of the proceeds to the Live8 charity. Everyone's a winner! If somebody wins a ticket it is theirs to do with as they please. This is a basic human right and not even Bob Geldof has the right to repeal that right. eBay is only a mechanism for selling. Does Bob really think that bad-mouthing eBay is going to stop tickets changing hands for inflated sums? This was a badly thought out move with predictable consequences. Instead of squealing when winners do what everybody must have known they were going to do, why not sell the tickets up front. They would still be resold for large sums but at least some of the money would have ended up in the cause's coffers. Bob Geldof, when he came up with this idea, should have known there would be a minority of people out there who would want to make a huge profit from the sale of these tickets. He, and his team, are as much to blame as anyone else. Once again the PC Police have imposed their morality on the rest of us. It is not against the law for eBay members to sell tickets - so those offended should simply not bid on the tickets. eBay offered their share of the fees to Live8 - will everyone else involved be doing that? What should be banned next on eBay - tickets to the "offensive" Jerry Springer Opera? Animal Liberation items? Urban music? Spray paint? 4x4's? The real profiteering comes from the already wealthy artists who are playing at these concerts - it makes them look good and increases their record sales. Is Geldof going to ban them making money in the future? I think it's sanctimonious rubbish, why shouldn't ordinary people sell their tickets and maybe make a little bit of cash? It doesn't affect how much is going to charity. Luckily we live in a free society so what is the problem with eBay helping people to sell their tickets. Good luck to them! If the tickets were being auctioned on eBay for money that would be sent to the Live8 charity I would not have a problem with this. The stronger likelihood is, however, that people are using a tragic global issue to line their own pockets. Disgusting. They should be thoroughly ashamed of themselves - and so should eBay for allowing this behaviour. There are other auction sites on the internet, which I'm sure will now contain these tickets. If I had bothered to text in for ticket, I would do exactly the same. I don't see what the problem is here. If I enter a charity raffle, win a car, then sell it, am I morally bankrupt? How are eBay supposed to realise that so many of its customers would get whipped up into such a frenzy over it? I can understand eBay backing down under the pressure, but it's a bit worrying when companies give way to the self-appointed 'morality police'. Tickets are still on sale on eBay even though they have been "removed". Was eBay just doing damage limitation on the headline news? It seems that profits come before everything else. eBay need to clean up the whole site and start being responsible for the content. Honestly don't see a problem with it. By law those tickets are the individuals property and if they wish to sell them, they can. How else are unlucky fans going to get tickets? He should have charged a nominal fee for each ticket. With the likes of Pink Floyd and Coldplay appearing at Live 8, people who go to festivals like Reading will pay up to ?60 just for a day ticket. A few people selling their tickets on eBay said they were going to give the money to charity. Whether they would or not is another matter. If I had Live 8 tickets, I would sell them on eBay....then make sure I gave all the money so I can help Make Poverty History! I don't blame eBay particularly, but I am angry that people like myself couldn't get tickets and then the people lucky enough to have won them are trying to sell them on for ridiculous prices - these selfish people never wanted to go to L8 in the first place and they have denied other people a chance of going. I think the people can do what they like; after all they won the tickets so they are rightfully theirs. And I understand about needing to give money to charity but why don't the celebrities donate some of their millions and stop hounding the little people. The problem is that people are losing sight of the actual issue (crippling world debt) because they are being blinded by the opportunity to see all of their favourite pop stars in one big historic concert. People are less concerned with the political message and this is in danger of getting buried beneath all of the hype. The people selling these tickets are just one symptom of this. The speed with which some of these tickets were posted shows that these people had entered the ticket lottery with no intention of attending and with the idea of selling the tickets on for massive profit. It is this sort of selfish action that will detract from the hard work that the people at Make Poverty History and its supporters have put in to try to turn the tide of world debt. These people should be ashamed of themselves! People should show more support than turning up to a free concert that they would have paid good money for in the first place if the political message is to be taken seriously. There is nothing wrong with selling your tickets, the event still gets the money from the text message and so does not loose out in any way. If people chose to have a gamble and enter the competition, then won, why should they not then sell the tickets? It's all very well Saint Bob whinging but for ordinary people £1000 pounds would probably be more useful than concert tickets-not all of us are rich stars who go around hobnobbing with other rich and famous people. Some of us actually struggle to pay our bills and have to save for our children's futures. I am fed up with Bob and his stupid moralising and holier than thou attitude. I think it's sad that so many people genuinely wanted to go and got their hopes up, only to be dashed by the fact that so many that did win tickets have now used them for their own monetary gain. Greed certainly does rule sadly. I am absolutely gutted I didn't get tickets to see this historical event. eBay really doesn't have a clue when it comes to ticketing. I just found out I've won tickets and I'm ecstatic! I'm really glad eBay has banned the sale of tickets, not only will it stop the super-rich having an unfair advantage, but it stops me having to choose between selling my tickets for thousands of pounds, or having one night of perfection! I think eBay was deeply wrong to ban these tickets to be re-sold. That money wouldn't have gone to charity anyway, and as long as the sellers would pay the correspondent tax on their benefits, I can't find anything wrong with it. Applying moral reasons on commercial issues is not right and it opens a very dangerous door. I understood the tickets were not transferable, hence by allowing people to sell them, eBay is helping the seller break the terms and conditions. What's the problem in selling the tickets on? So what if someone makes a few pounds. Will all those who were unsuccessful get the cost of their text messages back? No, it's the chance they took. Will all the bands who make increased royalties from record sales as a result of their appearance at Live 8 be donating these. Bob's a decent guy, but he does pontificate a lot. It just goes to show why people are going to Live 8. To be educated about poverty and do something about it, or to see their favourite band and feel superior to those that didn't go? These events will have no effect on poverty in Africa, they are a salve to the conscience of some rich pop stars and their fans. The sale of the tickets on eBay seemed like a great lifeline for friends of mine here in Holland who desperately wanted to go but were unable to enter the lottery as it was only open to UK residents. I do however, think that the general business of buying/obtaining concert tickets purely for resale for profit has to be sorted out - in my own experience I could only consider buying the highly overpriced Madonna tickets if I had bought extra and sold them for profit. This just puts the price up even further as the artists realise their fans are prepared to pay even more. People should sell the tickets for the price of the text message only. Otherwise all the bands, logistics groups, publicity volunteering to support the event are being undermined by people profiteering from the ticket sales. Is nothing sacred? How do all those people who condemn the eBay sellers of Live 8 tickets know if the sellers hadn't planned to donate the money they made from the sale to Live 8? EBay have shown hypocritical inconsistency with this decision to ban the resale of Live8 tickets. Why not extend it to all touted ticket sales? I'm bitter because I've missed out on getting tickets to a number of gigs, all of which have sold out during minutes, only to see them going for astronomical prices on eBay. Why should this be any different because it's for a fashionable charity? So Bob would like people in Africa to be able to make some money for themselves, but objects to people in this country doing the same? They aren't hurting the concert or what its about, so what's the problem Bob? People have to pay the bills man. Ticket touting, in any format, is disgusting but this was beyond the pale. Profiteering in this manner shows that people have no moral standards and will try to make money any way they can and if that is at the expense of people who desperately want to be at the concert, for the right reasons, then so be it. Excuses of 'no longer able to attend due to other commitments' are unacceptable. If this is the case then Live 8 should have been notified so that they can then re-allocate the tickets. As I understand it, Live 8 has not lost any money as a result of people selling the tickets. On the contrary, they might have raised more money from the sellers donating part or all of the proceeds. In any event, people will get round the ban by just selling tickets to people advertising saying that they want to buy the tickets. Absolutely. Anyone attempting to make profit from this, is a ghoul. They should give their ticket to a friend (though doubt they have any) or a stranger in the street or simply return them to Bob. The worst kind of opportunism, makes you wonder why they wanted the tickets in the first place when they clearly have little regard for anyone else. Mixing charity and capitalism is always messy. How many more CDs are going to be sold by artists appearing at Live*? Are they going to give the profits to charity for the additional sales? Where does personal and corporate greed meet just reward for talent and work done? Punishing the eBayers as crass capitalists is pretty big coming from some people who will make tens of thousands from appearing for "charity". It would be ok if the money they received for the tickets was to go to charity. But I guess this is not what will happen. Ebay should ban the sale of Live 8 tickets as it is wrong, wrong, wrong for these people to make money from something that is trying to do some good in the world. Have these people no conscience? I sold mine within 10 minutes for £1,200 using the buy-it-now option before eBay removed it. Sorry Africa, but I work 50 hours a week to feed my two kids and this will mean they can have a holiday this year. I texted a number of times in the hope I would be chosen and get 2 tickets to this concert, it disappoints me that people have tickets and just want to profit from them. Those tickets should be taken back, and handed out to people who really support the cause and fairly texted for the concert. I have just got a pair of tickets for the day and can't wait! It's on my birthday. I don't believe that eBay should have removed them as they were not illegal sales (in terms of UK law). The fault lies with the Live 8 organisers, if they had any sense they would have insisted that those who were awarded tickets paid a minimal fee to have a photo ID printed on them. There will always be people who want to make a profit and anybody who thinks otherwise has their head in the sand. It's up to individuals what they wish to buy and sell and, unless on the grounds of decency or legality, should not be subject to censorship from eBay, or anyone else. If eBay are concerned that their reputation will be harmed by allowing the sale of Live8 tickets, they should consider that those who let the actions of individuals through the medium of an online exchange service cloud their opinion of that exchange service probably wouldn't form part of their customer base anyway. Bartering and trade are as old as, and if an individual wishes to trade on their luck in winning a ticket, then so be it. Great, why eBay needed to be told I'll never know, i hope those people who sent many, many texts to get as many tickets as they could to sell on eBay are going to lose out, unless someone wants to pay £10 million for them! It is not eBay's job to police the marketplace. These tickets were now property of their owners who won them by entering into a contract that did not stipulate the tickets would be voided if resold and thus the sales were entirely legitimate. I am saddened at the vociferous response from people, especially after eBay promised a donation while now will not happen. It's profiteering off of other people's suffering. If people were not dying in Africa there would be no concert, therefore no tickets to sell. Ebay did the right thing pulling these auctions. Whilst the sale of Live 8 tickets is not illegal, attempting to profit from the auctioning of tickets for such a high profile benefit concert shows exceptionally poor judgement. If I were in the position of wanting to sell my Live 8 tickets I would make it very clear that any money made would be going straight to charity. Absolutely not. We live in a free country where we should be free to do whatever we wish within the law. Selling Live 8 tickets is wrong, but the opinions of an irate pop star should not affect our freedom to sell them. They should not be banned! Just because BG doesn't like the fact that ordinary people are making money out of this. What about the record companies et al who'll rake it in due to raising the profiles of the same old artists/hypocrites who trot out for these sort of things, professing there desire to help, yet not giving any money towards the setting up of the shows - leaving that to the punters who text in. They should have realised that this was going to happen and come up with a much better method of gaining tickets. Yes eBay was definitely right to do this. If people have won tickets but now can't attend there should be a system where Live 8 takes them back and auctions them on a website. The profit from these tickets should go directly to the cause charities, and not lost in the cost of arranging the gigs. Wake up and smell the coffee Geldof, capitalism is here to stay. You chose the way to distribute tickets and you knew it was open to abuse, don't come at us with mock horror. Concentrate on the concert and Africa that should be enough to keep you busy. EBay have actually done a service! They have displayed ethical and moral contempt for the dying and the dead, and have exposed the very source of where that misery comes from - capitalism! Utter nonsense. There is nothing illegal about selling something that belongs to you and eBay have shown themselves to be very weak. Very few people on the site objected to the auctions. The tickets were given away, no charities were cheated out of money. Sir Bob made it quite clear it wasn't about raising money but raising awareness. Well he couldn't have hoped for more exposure than this and I can't believe he didn't know this would happen. If he was that bothered he should have sold the tickets in the first place and given people a fair chance to get hold of them. I can understand Sir Bob's concern, but as the tickets did not contravene eBay guidelines, they should not have been removed. It's up to the individual to choose whether they buy or not. No, they should not have banned the sale. It is not their place to pass moral judgement. By doing so they have set a dangerous precedent for themselves. Yes. Not much more to be said really - the idea of people making profits off of what is meant to be a charity even is disgraceful. As long as demand outstrips supply and someone thinks they can make a quick buck then there will inevitably be a market of some sort. To expect otherwise is naive in the extreme. EBay's decision will only move the trade elsewhere. Whether the trade is illegal or merely in poor taste and contrary to the ideals of the Live 8 movement is another question entirely. I don't see what is wrong with it to be honest, if people want to sell them then let them. If people want to buy them, then let them. Sadly there's always going to be people who will make money from anything, and eBay are giving the usual "not our responsibility" act. However, as all of the tickets were allocated by text to a phone number, maybe Bob can have the last laugh - to get in, you need to bring that phone with you. If you've won the tickets and can't go, why not give them away in the spirit of the Live 8 concert instead of selling them on for a profit? Or don't claim them and give someone else a chance to see them instead! I think the only reason that Geldof is angry about this is the fact that he did not decide to sell them himself and therefore make even more money for what is, essentially, a very worthy cause. I cannot blame the ticket "resellers" for what they are doing, I will openly say that I would do the same if I won some tickets, but was unable to attend, as I have in the past with other commercial concerts. If eBay remove the sales, they are opening up a huge can of worms. Get off of your soapbox Geldof. I seem to remember that these people were charged for every text message that they sent in the competition. If they have therefore won a prize then it's theirs to do with as they please. It is nothing to do with what is, or is not lawful - eBay should show that they have a conscience and ban the sale of Live 8 tickets. Unless, of course, no-one there has a conscience and they are enjoying all the free publicity being gained from the headline news reports on this topic? Personally I don't see what the problem is. These people selling their Live 8 tickets, won them fairly. Now the tickets are theirs to do what they please with. Good luck to them. If I won a pair I'd sell them and watch Live 8 on the TV. Why didn't Live 8 see this coming? 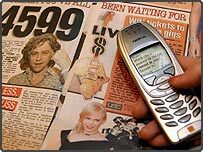 They could have asked for proof of who someone is - there is one well known phone company who have a regular scheme for tickets which means you need to show the text message in order to collect. Live 8 could easily have thought this one through!